From the chef, restaurant owner, and author of the critically lauded A Girl and Her Pig comes a beautiful, full-color cookbook that offers tantalizing seasonal recipes for a wide variety of vegetables, from summer standbys such as zucchini to earthy novelties like sunchokes. A Girl and Her Greens reflects the lighter side of the renowned chef whose name is nearly synonymous with nose-to-tail eating. 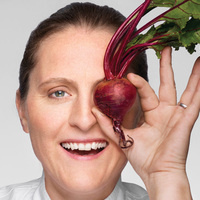 In recipes such as Pot-Roasted Romanesco Broccoli, Onions with Sage Pesto, and Carrots with Spices, Yogurt, and Orange Blossom Water, April Bloomfield demonstrates the basic principle of her method: that unforgettable food comes out of simple, honest ingredients, an attention to detail, and a love for the sensual pleasures of cooking and eating. About the author: April Bloomfield is Executive chef/co-owner of the New York restaurants The Spotted Pig, The Breslin Bar & Dining Room, The John Dory Oyster Bar, Salvation Taco and San Francisco’s Tosca Cafe. A native of Birmingham, England, April began her culinary studies at Birmingham College. From there, she went on to hone her craft through cook positions in various kitchens throughout London and Northern Ireland, first with Ruth Rogers and Rose Gray at The River Café and then to Berkeley, California, where she worked at the legendary Chez Panisse. Her New York restaurants have earned stars from the esteemed Michelin Guide and she was honored as a Food & Wine’s “Best New Chef” in 200. In May 2014, she received the coveted James Beard Foundation Award for “Best Chef: New York City.” April’s first cookbook, A Girl and Her Pig, was published by Ecco in April 2012. She lives in New York City. It was great! April was delightful and the sample was yummy!